Is a spacious, family-friendly, four-bedroom, three-bathroom home located in an exclusive, gated community just moments from The Magic. 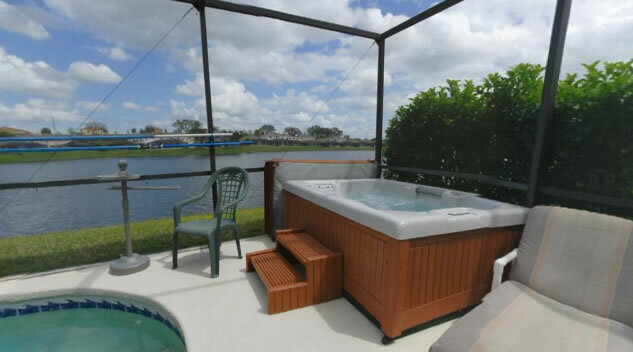 Our lovely, Disney-decorated home faces a conservation area and our sparkling pool and spa overlook a serene lake. 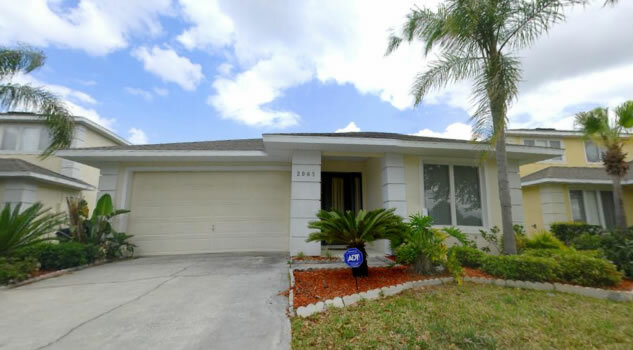 The home was remodeled in August 2006 and now features new tile floors throughout and fresh interior paint, in addition to the new features highlighted below. Just completed, the "Nemo's Hideout" game room is eqiupped with a brand new pool table and foosball table. The room is also furnished with a comfortable sofa (converts to a sleeper) where you can watch the game action. 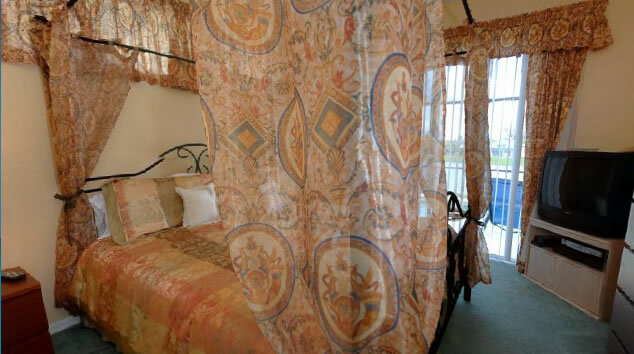 Our light-and-bright master bedroom has a sliding door to the lanai and pool area. This room is equpped with a brand new king-sized bed, alarm clock, TV, DVD and VCR. The large bathroom has a double vanity, large garden tub with roman faucet, large shower, and walk-in closet. This room is decorated as Mickey and Minnie's country garden. In addition to the comfortable, brand new queen-sized bed, the room is equipped with a CD alarm clock, wicker armoire, TV and DVD player. A second bathroom is located right next door (hallway entry), and features a single vanity and a tub/shower combo. 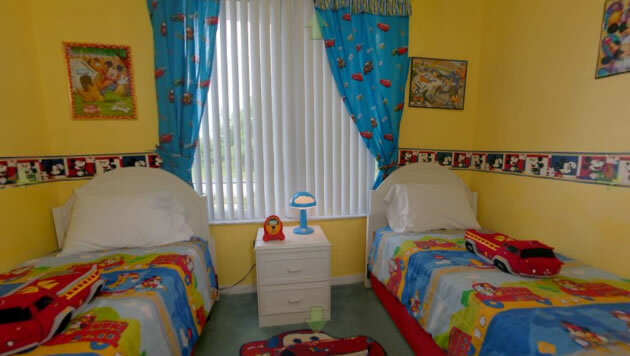 The two twin bedrooms are decorated with your children in mind, in Princess and Mickey themes. 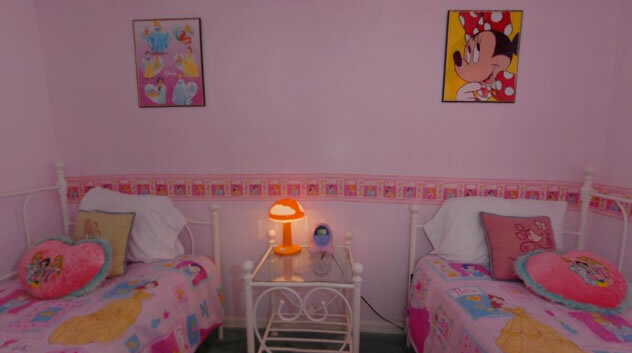 The pretty-in-pink Princess room has a TV/DVD combo and the brightly colored Mickey room has a TV/VCR combo and Playstation. These rooms share the third bath, with a walk-in shower and single vanity. The kitchen has every major appliance including a full-size range, refrigerator/freezer with ice maker, waste disposal unit, dishwasher, and microwave. 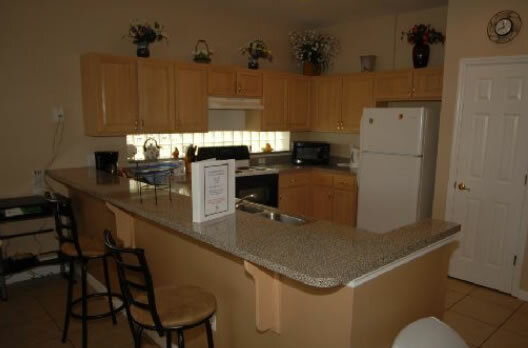 The kitchen is also outfitted with dishes, cookware, flatware and utensils -- just like home! The separate laundry room is equipped with a washing machine, dryer, iron and ironing board. For your convenience, all linens and towels are supplied. The living room, with sliding doors that open all the way for indoor/outdoor living, has brand new 32-inch TV, a VCR/DVD player, and a stereo with CD player. In the entertainment center, we have a wide selection of DVDs and VHS tapes. The new living room furniture -- sofa, loveseat, tables and lamps -- offers comfort and style. The adjoining formal dining room with its stylish new Mickey Mouse chandelier has a sliding door leading to a covered lanai and informal eating area. Our sparkling pool overlooks the serene lake, and the screened enslosure gives you the outdoors without the bug worries. 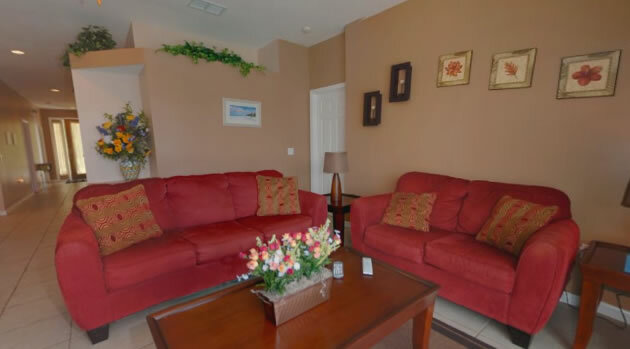 The comfortably furnished lanai is everyone's favorite sunny spot. After watching the sunset, take a private swim or soothe your tired muscles in the spa. Be on the lookout for the Magic Kingdom fireworks. Providing our smallest visitors with all the conveniences of home, we offer FREE the full use of our baby / toddler package. This includes a single stroller, double stroller, baby monitors, high chair, pak-n-play and bed rails. 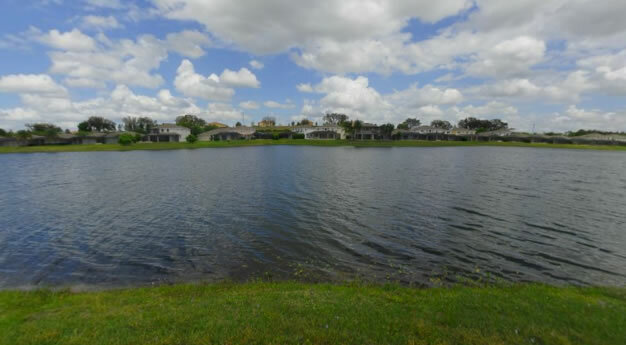 The home is just two miles from the Formosa Gardens Shopping Center, which includes a Winn Dixie market, TGI Fridays, Outback Steakhouse, Subway, Giordano's Restaurant, Cracker Barrel, Carrabba's, Taco Bell, Dairy Queen, Eckerd Drugstore, and a quick care clinic, among other shops and restaurants. A Wal Mart Supercenter is located less than five miles away. The Walt Disney World entrance is less than 10 minutes away; Universal Studios and Island of Adventure, 20 minutes; Sea World, 15 minutes; beaches, 60 minutes; and name-brand outlet malls, 20 minutes. 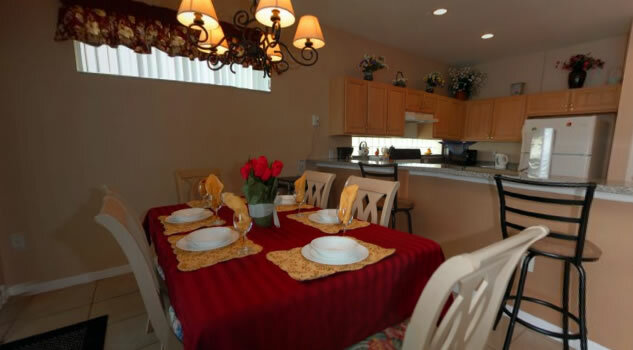 Located in a secure, gated community, the home also has alarms on the sliding doors leading to the pool area for the safety of all our guests. We offer a keyless entry system to allow you to start your vacation as soon as you arrive.